Did you know that Stampin’ Up! has decided to bundle all their major announcements and offers every Tuesday? That will certainly make it worth your while to be sure to visit me every Tuesday for all the latest and greatest news and specials! And what a kick off today has! You know how stinking cute our new snowflake bundle is, right?? Well, some of you didn’t purchase the stamps and framelits, stating it was out of your budget. Well, here is an affordable option for you! Use Hostess code: 4UQ76FA6 when you check out and you’ll get the preferred price and be entered in my November online order contest! 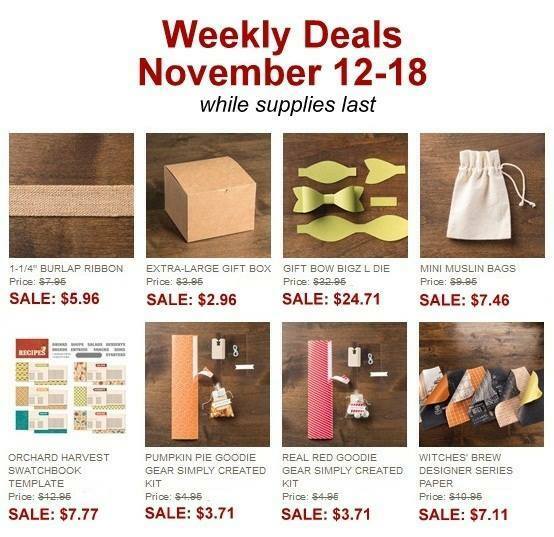 Also- here are the new weekly deals good from now through Monday 11/18/13 at midnight! Happy Shopping! (Why not stock up for all those neighbor, co-worker, teacher, or classmate treats you want to pass out??) Just a thought. Let me know if I can help in any way. Thanks for visiting my blog! Image November 12, 2013 Lynnzcrafters	Christmas, Stampin Up, Stampin' Up Specials, Stampin' Up! Kits	Leave a comment Festive Flurry Ornament KitNew Kits!Stampin' Up Specials!